In this section, you will learn more about running Java programs in the workbench. In the Package Explorer view, find junit.textui/TestRunner.java and double-click it to open it in an editor. 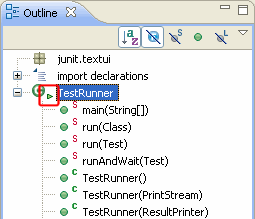 In the Outline view, notice that the TestRunner class has an icon which indicates that the class defines a main method. 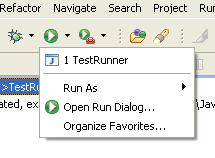 Right click on TestRunner.java in the Package Explorer and select Run As > Java Application. This will launch the selected class as a local Java application. 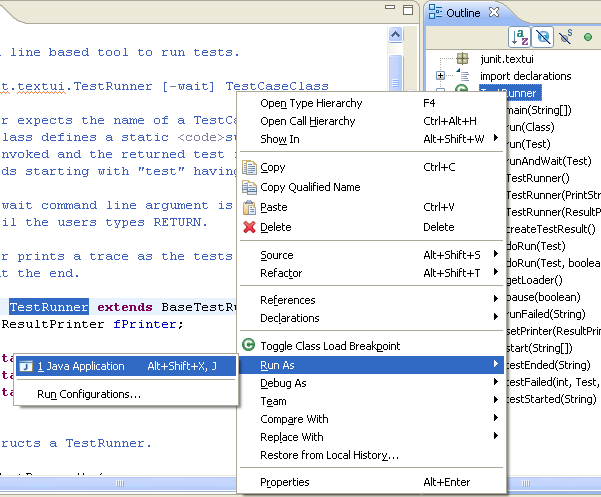 The Run As context menu item is also available in other places, such as the Outline view. Notice that the program has finished running and the following message appears in the Console view telling you that the program needs an execution argument. Running class from the Package Explorer as a Java Application uses the default settings for launching the selected class and does not allow you to specify any arguments. You can also Ctrl+Click a configuration in the drop-down menu to start editing that configuration. 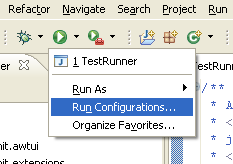 This time, the Launch Configurations dialog opens with the TestRunner launch configuration selected. A launch configuration allows you to configure how a program is launched, including its arguments, classpath, and other options. (A default launch configuration was created for you when you chose Run > Java Application). Select the Arguments tab and type junit.samples.VectorTest in the Program arguments area. Click Run. This time the program runs correctly, indicating the number of tests that were run. Switch to the Debug perspective. In the Debug view, notice that a process for the last program launch was registered when the program was run. Note: You can relaunch a terminated process by selecting Relaunch from its context menu. Select the drop-down menu from the Run button in the workbench toolbar. This list contains the previously launched programs. These programs can be relaunched by selecting them in the history list. By default the currently selected resource or active editor is launched when the run button is hit. If none of these is launchable the current project will be launched. You can configure this behavior under Run/Debug > Launching. From the context menu in the Debug view (or the equivalent toolbar button), select Remove All Terminated to clear the view of terminated launch processes.